Syracuse, NY (April 8, 2019) – If you are planning to arrive early to ride Destiny USA’s Carousel over the next few weeks, you may want to push back your schedule. The renowned horses are receiving a little tender loving care this spring. 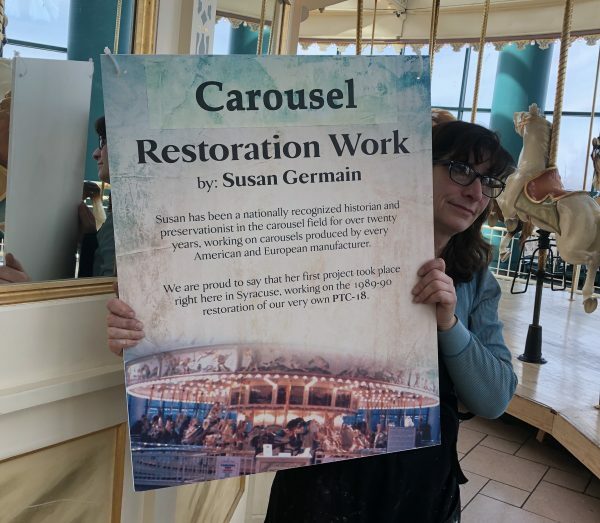 Susan Germain, a nationally recognized historian and preservationist for carousels, will be onsite conducting restorations on the historic Destiny USA Carousel, along with her apprentice Allison Perkins. The Carousel will be closed Monday – Wednesday, from 10 AM – 12 PM for the next three to four weeks. The media is welcome to stop by for photos and b-roll on Tuesdays (best day for visuals) but please hold all interviews until after 12 PM. Wednesday is varnish day. Susan performed the initial restoration of the Destiny USA Carousel in 1989. She has consecutively worked on the horses from 2000 until the present. Destiny USA’s Carousel, PTC #18, was originally built by the Philadelphia Toboggan Company as the eighteenth in a series in 1909.